Our application process is designed with safer recruitment in mind at all times. 1. Make sure you have read our important information before you apply. 2. Complete an application form. Your application should reflect you! Your application form will not save automatically, and so if you need to step away, hit save. If you want to go back to the previous page, do not use the back arrow on your device as you will lose your progress. Once you have submitted your application it is imperative you add ‘richard@xukcamps.com’ and ‘jobs@xukcamps.com’. 3. Keep checking your emails - even your spam/ junk. Following submission, we will be in touch very quickly letting you know whether or not you have been invited to an interview. If you are invited to an interview, please let us know ASAP if you will be attending as the invitation is only valid for a short period of time. If you confirm your attendance and change your mind or something comes up, please tell us straight away. 4. A week or two before the interview we will send you an email with some key steps that need to be followed before we meet you. DBS Registration. This will only take a few minutes. Failure to complete this could cancellation of your place at the interview . What you will need to bring to the interview. What you will need to prepare. You are also interviewing us. Make sure you have some questions to ask. 5. It’s interview time! There will be group work, a chance for us to ask you questions and vice versa. It’s a lot of fun! 6. We will be in touch very quickly to let you know if we will be offering you a position or not. If you decide we are not for you following the interview, please let us know. 7. Once an offer is accepted, we will send out your contract, your job description and a staff handbook. 8. You will need to review the contract and job description, letting us know if there are any issues or if you have any questions. Once satisfied, sign the contract and return. 9. When we have received your signed contract we will process the reference checks and let you know if there are any issues. 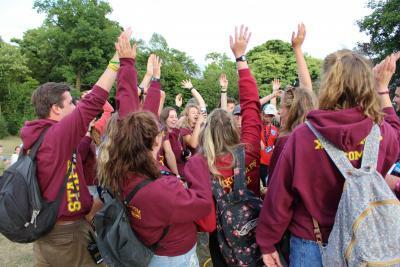 The best thing about camp is the the 'family feeling' that XUK promotes. It is very unique and makes working at camp EVEN more enjoyable!